The purpose of our project is to promote students' scientific thinking when confronted with controversial and/or complex Earth and space science topics. We do this by using an instructional scaffold called the model-evidence link (MEL) diagram. We are currently adapting this scaffold to enable students to build their own MEL diagram, which we call the build-a-MEL (baMEL). Topics for MEL and baMEL activities include: climate change, earthquakes and fracking, wetlands use, formation of the moon, extreme weather, fossils and Earth's past, freshwater availability, and origins of the universe. 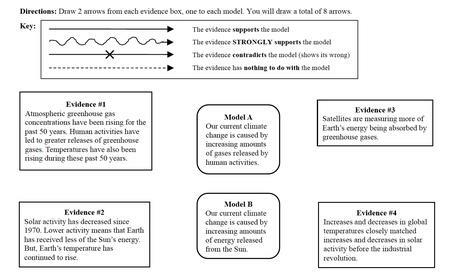 We use an instructional scaffold called the model-evidence link (MEL) diagram to promote students' scientific thinking when confronted with controversial and/or complex Earth and space science topics. Students are provided with models that explain scientific phenomena. For a given MEL, students are presented with the scientifically accepted model and an alternative model. They evaluate four lines of evidence that either support, strongly support, contradict, or have nothing to do with the model. Students then complete an explanation task describing their reasoning for how they connected the lines of evidence to the models. We are currently adapting the instructional scaffold to enable students to build their own MEL diagram, which we call the baMEL. With the baMEL, students choose two models from a set of three that they find to be most plausible to explain a given scientific phenomenon. They then choose four lines of evidence from a larger set. 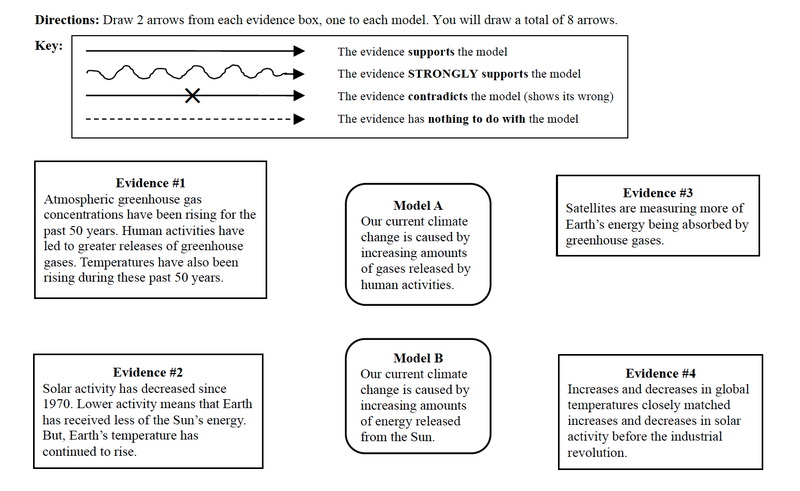 Once again, they evaluate the lines of evidence, connecting them to the models with arrows that indicate whether the evidence supports, strongly supports, contradicts, or has nothing to do with each model. During the process of building their MEL and baMEL diagrams, students work in groups discussing the models, the lines of evidence, and the rationale for their choices. MEL and baMEL activities may help students to critically evaluate connections between evidence and explanatory models. At the conclusion of a MEL or baMEL activity, students may revisit their original ideas and deepen their understanding of scientific concepts and practices as they are led through a discussion of the scientifically accepted model of the phenomenon and associated lines of evidence. This project is supported by the National Science Foundation (NSF) under Grant No. DRL-1721041 and Grant No. DRL-1316057 and is part of NSF's Discovery Research K-12 (DRK-12) program. Any opinions, findings, conclusions, or recommendations expressed are those of the authors and do not necessarily reflect the NSF's views.